What Do Libraries Call Users, and What Do Library Users Think of Themselves in relation to Libraries? In American Libraries Magazine, Anthony Molaro wrote a piece titled “Just Who Do We Serve?” There, Molaro mentioned an interesting fact that caught my eyes. Did you know that library users actually preferred to be called “member” rather than “patron”, “customer,” or “user?” According to a recent survey, that is the case. Throughout my entire library career since early 2000s, the term that refers to library users which I heard most from the library staff was “patron.” I don’t recall any library staff calling a library user “customer” or even “user” back then. As a very new part-time library assistant, I took it that this term “patron” meant pretty much “customer” in the sense that it is the customer (=patron in the library) that is the king. Library membership = CVS or Costco Membership? I am not against the idea that as the library staff, we do and should strive to create and support the maximum satisfaction of library users. I am just pointing out that there seems to be some interesting difference between how libraries and library staff view library users in their operation and how library users consider themselves in relation to the libraries they frequent. Side note: I have realized that I often use the term “user” to refer to library patrons. But that’s just because I work mostly in the context of web services. I use this term ‘user’ out of habit, not as any result of reflection. Interestingly, I found that some who work in the areas of web design and development (not library-related) actually prefer a term different than “user.” Jenifer Hanen, a web developer/designer, said once on Twitter that she preferred “people” or “customers / clients” opposed to “user.” I am guessing here, but it is probably because all the other terms than “user” seems to imply that they are not just some abstract entity that comes into a website and click links but the actual people with certain interests and preferences etc. The survey result that Molaro cites seems to point out the very same kind of interesting difference that I have noticed between how libraries and library staff view library users in their operation and how library users consider themselves in relation to their libraries. It shows that library users (in lieu of no better term here) think of themselves as library members rather than library patrons, library customers, or library users. Molaro continues to detail his view on what each term is likely to signify. According to him, “library patron” as a term represents the worldview in which libraries are indebted to them, patrons. By the way, this matches with what this term brings to my mind. “Library user,” on the other hand, makes Molaro think of those who consume without creating. And he opposes to the use of this term because, in his opinion, this term implies that the users need something the library offers but the library do not need them. I disagree on this. I actually like the term ‘library user’ because it always reminds me of the fact that there are many other places where they can go for their information needs. It reminds me that libraries are not the only source for them and it is unrealistic to, say, argue that all library users should start their research at their library homepage rather than Google. But again, this could be just me working mostly in library web services. Molaro likes the term “library member” since he thinks that this term implies ownership and an active role. And he says “people served by libraries view themselves because they carry a library card.” Now, I am in 100% favor of library users or patrons or members having the feeling of ownership and active role in relation to their libraries. But I do not think that library users prefer to be called library members because of the feeling of ownership and their active role in libraries. I carry and use the CVS and the Costco card. This doesn’t make me feel ownership towards these companies, or in any way I imagine myself playing an active role in them. Am I a member? Probably, since I have a card, a membership card. If the membership costs money, then, definitely the term, ‘membership’ is more fitting because it implies that some kind of services and privileges are rendered to me once I join (whether free or not). I get points at CVS and enter/buy stuff in bulk at a lower price at Costco with my membership. Now as a library member, I don’t pay the membership fee, but I get to borrow books and other library items. So there, in my mind, I am a member in relation to my local library just as I am a member of CVS or Costco. I am not saying that this is the mental perception that libraries want their users/patrons/members to have in relation to them. I am simply saying that this might be the actual mental image that most of our library patrons/users/members have about their relation to their libraries. Much like other organizations, institutions, and businesses, libraries should consider implementing a preferred member card program. This preferred member card could be purchased through an annual fee and would have perks and privileges. For example, hot new bestsellers are purchased for regular library members and extra copies purchased for preferred members. Perhaps preferred members would not be subject to late fines, or entitled to extended loan periods, being cited on an honor roll, or invited to a special party? The preferred member card could be a part of a larger membership and fundraising drive. Much like NPR or PBS, libraries can incorporate preferred membership drives into their National Library Week or National Library Card Month promotions. Well, what do you think? I am divided on this idea for many reasons. And I am not going to go into those reasons here, because at this point, many of us, librarians, will have minds bouncing left and right and up and down just thinking about those reasons and what the best direction would be. So it might be the best to let them percolate a bit before shooting ideas to the sky. How do you make the library members care about their libraries? Anyone can become a library member (no investment required) and there is nothing they gain by being an active member (no incentive provided). Just as a reminder, we all know that libraries do 2. intentionally as its mission is not to generate profit but to provide equal access to information for both the under-served/underprivileged and the well-to-do. Now 2. has the problem: no investment and no incentive. Human beings tend to care much less about the things they get for no investment; they are also highly likely to be involved very little with things that they have no incentive to do so. So 2. creates an obstacle to achieving 1. How can libraries achieve 1. without endangering 2.? That’s a million dollar question for libraries. Many assume that adding more information would automatically increase the usability of a website. While there are cases in which this would be true, often a better option is to make that needed information not necessary at all for a user to make the right choice in the first place. 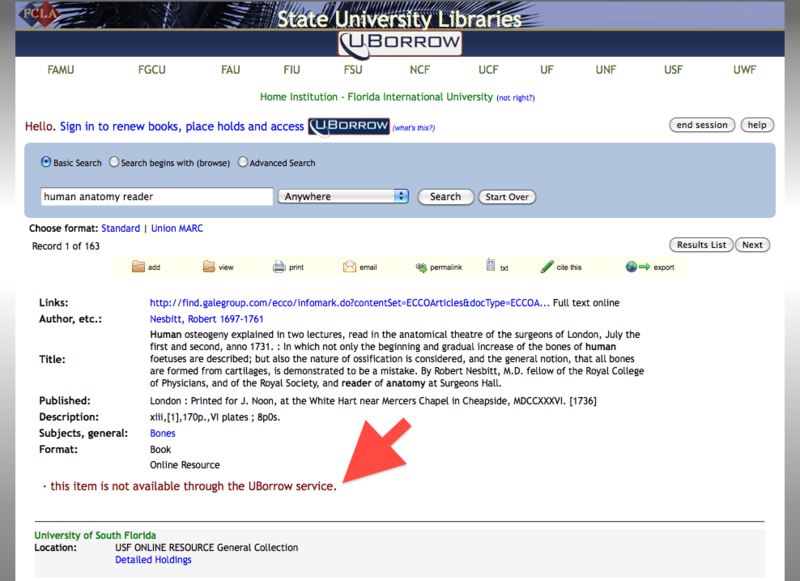 In order to advertise this service and make it easier for users to discover, the search result screen in the library catalog now shows the U-Borrow option as a link (as shown below). 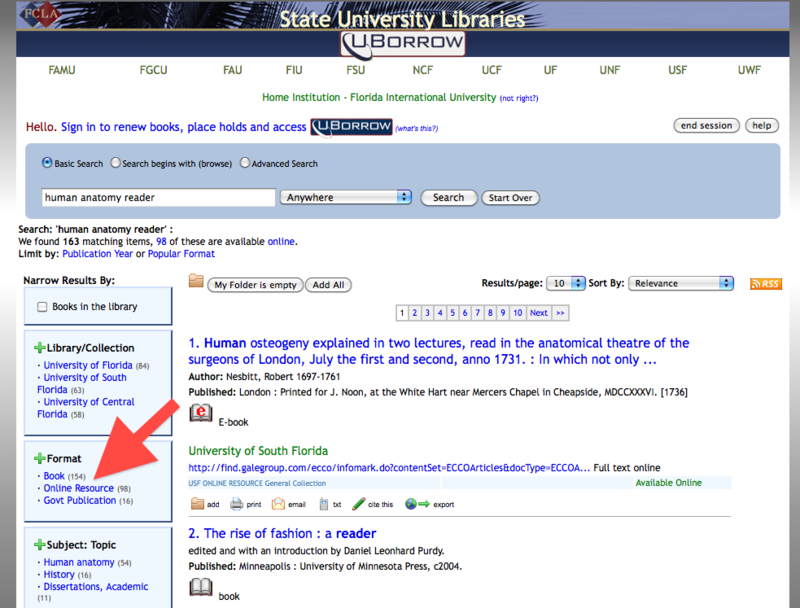 If the user clicks the U-Borrow link, the computer presents the search search result done in the union catalog. 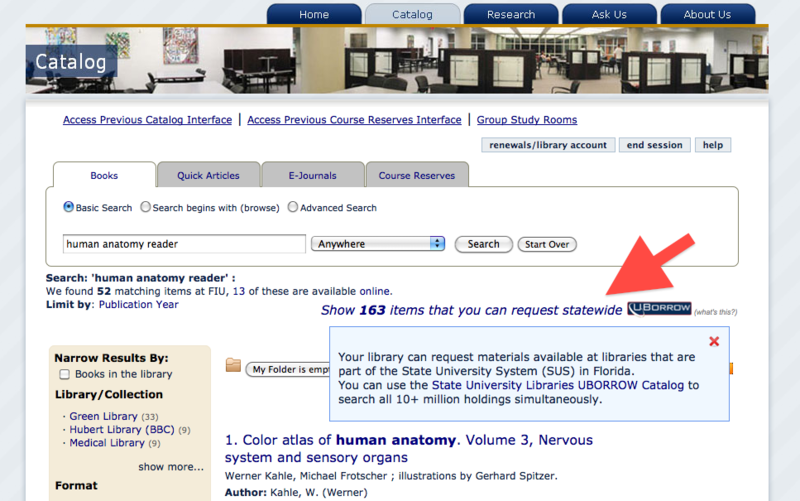 This allows the user to see what state university library may have the item s/he is looking for that is not available in her or his own university library, and to request the item from the closest library from his or her own. But there is one problem. Since the original search in the user’s own library catalog was not restricted to a particular format, the U-borrow link also presents items in all formats that match including online resources(see below). But(!) the U-borrow service does ‘not’ apply to online resources. This is a solution. But not the best solution. If a user gets to this page, s/he is likely to just click the link on top and get frustrated instead of examining the record fully by scrolling down and recognize the note at the bottom. So in this case, the best solution would be to make the U-Borrow link in the first screenshot result in only the items available through the U-Borrow service. This will obviate the need for the user to heed later the note about certain items are not available. By removing irrelevant options in the first place, we can allow users to make the right choice without making a conscious choice. Can you think of similar examples like this? Guiding people to make the right choice by providing information is good. But all the better if the right choice can be automatically selected based upon the previous option. 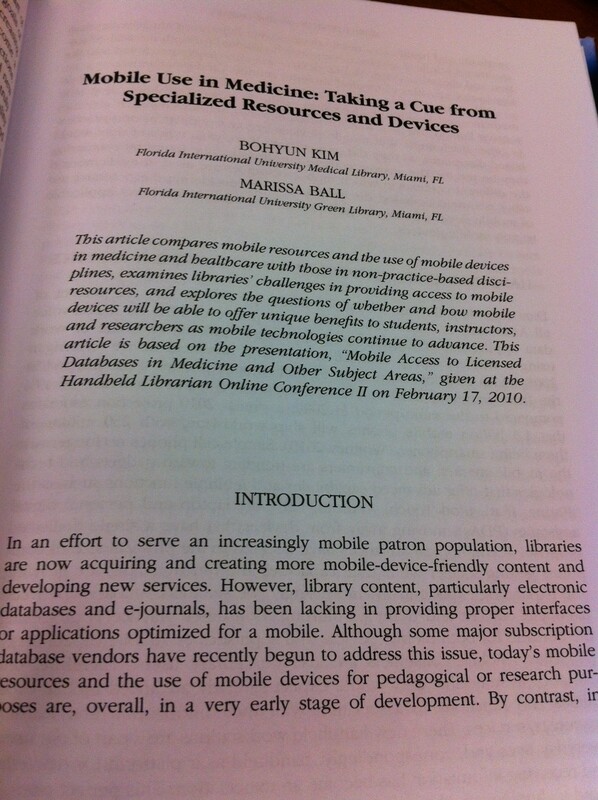 The presentation that I gave with my colleague, Marissa Ball, at Handheld Librarian Online Conference II (February 17, 2010.) 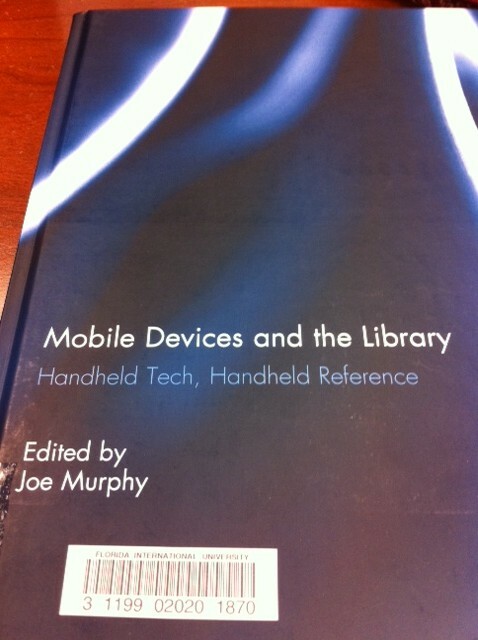 is now out as a book chapter in the new book published by Routledge, Mobile Devices and the Library: Handheld Tech, Handheld Reference (ed. Joe Murphy). 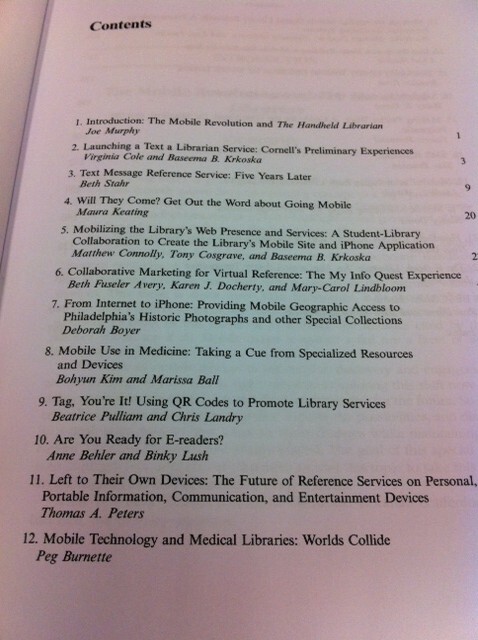 This is the first time my article has been published as a book chapter. So I am pretty excited. On the other hand, I am realizing how much time can pass between a presentation and a publication. You can see the original presentation slides here: http://www.slideshare.net/bohyunkim/mobile-access-to-licensed-databases-in-medicine-and-other-subject-areas. Before becoming the book chapter, this presentation was also published as an article in The Reference Librarian 52(1), 2011. I took a few shots from the book processed today at the library. If you ever had the feeling that your library space might look somewhat dull and unexciting, there might be some relatively simpler ways to change that. The university I work at has two separate campuses and I work at one of them. But this week, because of some committee work, I spent time at the other (BBC) campus. This was actually the first time that I had time to look around the library there. 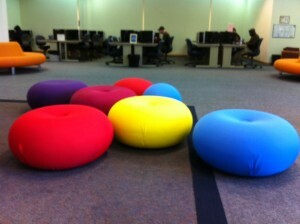 And I immediately noticed these colorful chairs on the first floor. The library building at the BBC campus has a pretty traditional look. 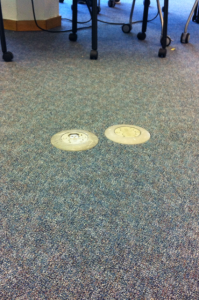 The building is clean and neatly kept, but the colors of the wall and the carpet are neutral and conservative. While this might induce the sentiments suitable for serious study and concentration, the uniformly neutral colors may also create an impression that the library is dull and boring. I was quite impressed by how these several colorful chairs do a great deal in counteracting such an impression. Considering that re-painting or re-carpeting is quite expensive, adding some color chairs like this can be a simple and effective way to create a more positive impression about library space to users. While I was hanging out at the first floor, I was looking for a power outlet to plug in my laptop. 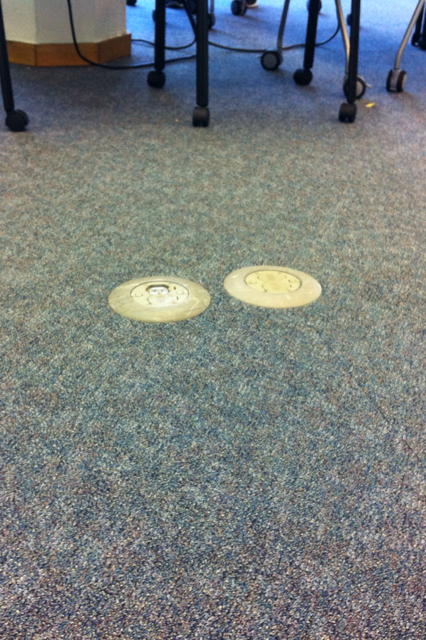 The BBC campus library has power outlets on the floor in addition to some on the walls. This is a great feature because often users would be studying in the middle of the library space where they would be too far away from the walls. However, the power outlets are not very visible in its white color. Considering that a lot of library users look for power outlets, it would be great if they are made visually more prominent. To come to think of it, hard-to notice power outlets are a problem in other places. At any coffee shop, the tables near the wall where power outlets appear are often the first ones to be taken. The same goes for the chairs near power outlets at an airport. I would be delighted if I can easily locate a free power outlet at a coffee shop or an airport. This means that easy-to-notice power outlets are one sure way for coffee shops and airports to win me over as their client. Granted power outlets are not the major function of a coffee shop or an airport. But if it is an amenity that is highly sought-after by users, then why not make it easy for them to find and use it? I wonder what other secondary functions or non-major amenities of a library are frequently used by library patrons and how we can make them stand out more. Perhaps, libraries can match those features with services or resources that they want to promote for a better marketing effect. Librarians and libraries’ value lie in playing the role of the middlemen between the public and scarce content (books/information ). Books and information are no longer scarce and rather abundant in the digital era. The public can now directly access books and information without mediation by librarians and libraries. Therefore, libraries and librarians may become no longer needed. In order to avoid extinction, libraries and librarians must change from being the middlemen and the warehouse of content. Libraries are more than warehouses of books, since they provide valuable services, programs, and physical space. It costs to obtain information, which makes it, by definition, not abundant. Information is not so easily accessible considering how much instruction librarians have to provide the public regarding how to use them. While these objections may well have some points, would they make sense to library users? Are library users convinced that these objections prove the sufficient value of libraries and librarians? If you work at an academic library, you would have met at least one academic who asks why a library is still needed. They say everything is online. I bet you have immediately cited the objections above. Did those objections convince the person? If you work at a library, you would have met a library user who thinks librarians are mere clerks who purchase and shelve books. Did bringing up the points cited above persuade the person to think differently? Or did you just get a shrug out of the person? To the eyes of most library users, the most important benefit lies in books and articles, not in reference, instruction, or any other library services or programs. So they regard libraries as warehouses and librarians as middlemen. If the survival of future libraries depends on the users’ perception and judgment on the value of libraries, the concern Godin expresses is not necessarily hyperbole. And this public perception of libraries and librarians as warehouses and middlemen signifies the failure of proving the unique value of a library in the digital era. 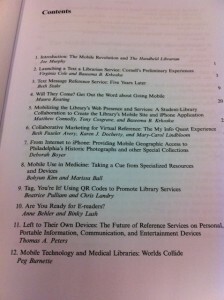 What will take to persuade users to become the advocates of the future libraries? I don’t think raising the objections cited above will do the trick because they have been failing for a long time. Despite our best efforts, reference volume is going down and the place of library instruction in a curriculum is mostly marginal. If the cost for information goes down sufficiently and users can get faster and easier access, they may be willing to pay content-providers directly than libraries (indirectly through tuition/tax). Looking back at the past and picking up the things that already have been tried with little success will not take us very far. And we don’t want to bet the future of libraries entirely on the current states of academic libraries being an accreditation criterion or those databases having unfriendly user interfaces. I think it is time to stop arguing about how valuable libraries already are and start building some new visions about the future library. One idea that frequently comes up is the library as a community center connecting people with information. It’s not a bad idea, but it needs more details. How are libraries going to connect people with information in the way the mediation of libraries and librarians is ‘welcomed and appreciated’? Do our current libraries have a seed of the future libraries that beyond doubt presents indispensable value to library users? While possibilities abound, we do not have many convincing and attractive visions of future libraries that make sense to our users. Here are some random ideas to start with. Not necessarily daring, inspiring, and by no means exhaustive or revolutionary but just to ignite more conversation. It is not easy to imagine things that do not exist yet. But right now, we need more imagination than criticism or skepticism. I hope and believe that if we have a worthwhile vision, we will be able to work to obtain sufficient resources to make it happen. b. Libraries as Production Agencies? The role of libraries has been traditionally focused on services that bring a third party’s product to users. But what if libraries place more weight on creating products of their own? Users will go to libraries to look for content that is curricular, educational, local, or for entertainment. Such content will not be simply curated and listed together but be produced as a complete stand-alone product. This will take libraries into the realm of content business. c. Libraries as Institutional or Regional Knowledge Management and Preservation Agencies? Even though libraries are already assuming this role to a certain degree, envisioning the future libraries as mainly a knowledge management and preservation agency will bring a significant shift in the library operation. Libraries will actively collect, curate, and provide access to the knowledge asset generated by an institution or a region that it serves. It will also function as a support center and a hub for those who create and produce such knowledge asset. d. Libraries as a Competitive Intelligence Center? Librarians could be trained to specialize in collecting, comparing, and analyzing data, which will only increase in volume in the digital era. Offering competitive intelligence service and products can significantly increase the value of libraries to the decision makers whether administrators in academia or small business entrepreneurs. The service and product offered in this case may be similar to those of corporate libraries through fee-based services. Add you own ideas here. (i) Do not restrict your vision by current library structure, services, programs, staff, funding, or other existing conditions. (ii) Imagine the value of a library that will appeal more to ‘users’ than to librarians.